The Advanced Temperature Transmitter (models ATT60/70) is a field instrument that converts inputs from thermocouples, mVs, and resistance thermo-bulbs into analogue (4 to 20mA) and digital signals and transmits them to receivers. Various parameters can be remotely set and self-diagnosis can be performed through the Smart Field Communicator (SFC). It can also execute two-way communications between the SFC, or HART® 375 communicator, and, via DE protocol, with the TDCS3000 or 3000X and a database, thus facilitating self-diagnosis, range resetting, and automatic zero adjustment. This makes the transmitter easier to maintain. Settings, adjustments and self-diagnosis can be done easily by SFC or HART communicator. ThermoPLUS handles all thermal sensors, and any temperature range can be set as required within the one transmitter, thus giving the optimum range for a given process. 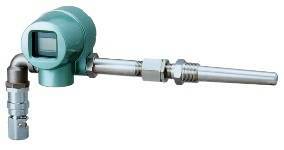 The transmitters are available with a range of flexible sensor types, thus reducing engineering work costs. The models ATT60/70’s two-wire system requires no compensation wires or field cables. Abnormal input indication: When temperature sensor output fails. Thermocouple disconnection indication: Thermocouple is disconnected. Even if out of range, the necessary data can be read afterward from the holding function of the maximum and minimum PV values. Convenient integral digital indicators available as an option (0 to 100% even scale), allowing simultaneous field display indication and signal transmission. ThermoPLUS has acquired the various Explosion protection approvals, including TIIS and FM.